When you're heading in to work on a bright sunny day, wouldn't you just rather be fishin'? If so then we have the decal for you. 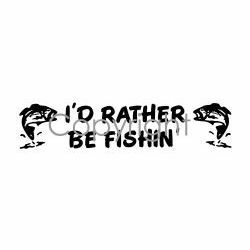 These Freshwater Fishing vinyl decals and stickers are for display on trucks, cars, trailers, boats, gun cases & other smooth surfaces.